Advances in Solar Heating and Cooling presents new information on the growing concerns about climate change, the security of energy supplies, and the ongoing interest in replacing fossil fuels with renewable energy sources. The amount of energy used for heating and cooling is very significant, estimated, for example, as half of final energy consumption in Europe. Solar thermal installations have the potential to meet a large proportion of the heating and cooling needs of both buildings and industry and the number of solar thermal installations is increasing rapidly. 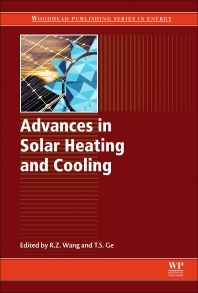 This book provides an authoritative review of the latest research in solar heating and cooling technologies and applications. Research and development professionals and engineers in the solar heating and cooling industries as well as postgraduate researchers in academia working on solar heating and cooling. Professor Ruzhu Wang has been Director of the Institute of Refrigeration and Cryogenics, Shanghai Jiao Tong University since 1993 and is a leading scientist in the area of adsorption refrigeration research and solar cooling. In recent years he has also had a deep involvement in green building energy systems. Prof. Wang has published more than 300 journal papers, about 200 of which are in international journals, and has written 5 books on refrigeration technologies. He was elected as one of the top one hundred outstanding professors in China Universities by MOE China in 2007. Prof. Wang was appointed deputy Editor-in-Chief for the international journal Energy and Associate editor of Solar Energy. In the last ten years, he has been invited to give plenary lectures in international conferences more than 10 times. Tianshu Ge is a Professor at Shanghai Jiao Tong University, China.